Yesterday at the 2017 US Circular Economy Summit, the World Business Council for Sustainable Development (WBCSD) officially launched its Practitioner Guide to the Circular Economy after a three-week beta testing period. Following the launch of WBCSD’s CEO Guide to the Circular Economy at the World Circular Economy Forum in Helsinki, the Practitioner Guide was created specifically for sustainability professionals in design, procurement, marketing, waste management and financing. 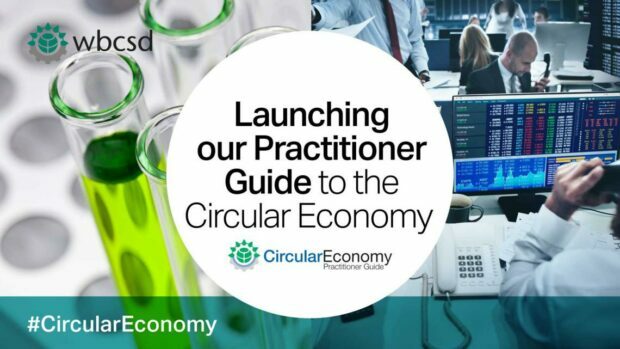 The Practitioner Guide offers insight into over 70 strategies, 40 examples, 90 resources and numerous tools that companies can use to implement the circular economy. It’s a living catalogue that will be continuously updated to include the newest examples, strategies and tools in the circular economy space. Users can explore the Guide to learn what circularity is, how it impacts business and what companies can do to move away from the linear “take, make, dispose” model. The Guide is an open, freely available tool. Companies with compelling case studies and/or effective tools are encouraged to submit their content to the Guide. The idea is to make circular economy information easy-to-understand and widely accessible for businesses of all shapes and sizes. “Through this Guide, we hope to make the circular economy accessible and actionable for everyone,” said Brendan Edgerton, Manager for WBCSD’s Circular Economy work and key architect of the Practitioner Guide. WBCSD is encouraging sustainability professionals from around the globe to visit the Practitioner Guide and bookmark for further use. The Circular Economy team will be conducting a series of workshops and webinars on the Guide in the upcoming months – stay tuned for updates. Hey Buddy!, I found this information for you: "WBCSD launched the ”Practitioner Guide to the Circular Economy’". Here is the website link: https://www.duurzaam-ondernemen.nl/wbcsd-published-the-practitioner-guide-to-the-circular-economy/. Thank you.